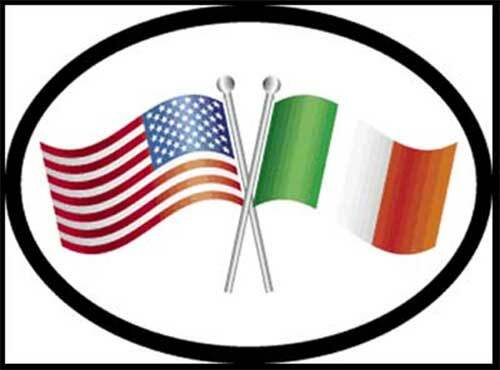 The Irish and American flag decal is made in the United States; it is available at The Irish Gift House. The crossed American and Irish flag decal is printed on waterproof laminated, durable vinyl stock with UV (ultra-violet) blocking inks. The US and Irish flag sticker has non-permanent adhesives for easy removal making them great for cars and travel trailers along with boats and motor homes. The 3 ½” x 4 3/4” oval Irish flag decal is also suitable for trucks and motorcycles. United States decal is an oval design that features the American flag.